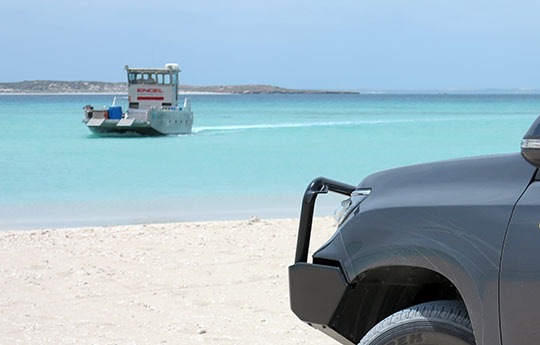 My research travels for my forthcoming book Australia’s Islands took me to the Houtman Abrolhos Islands off the west coast of Australia and then further north to Dirk Hartog Island. ▲… and then a short barge trip across to the island. 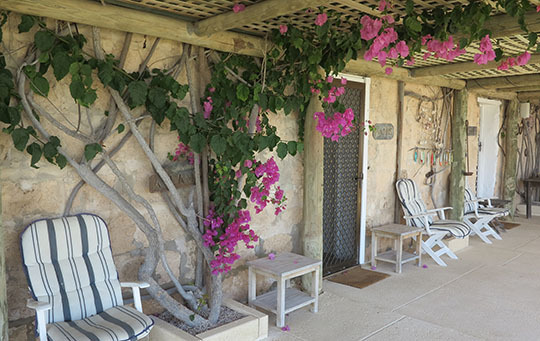 ▲ Where you can stay in the rather wonderful Dirk Hartog Eco-Lodge towards the southern end of the island. ▲ The big attraction, however, is right at the other end of the island, Inscription Point on the north-west corner. In 1616 Dutch explorer Dirk Hartog landed here and left a pewter plate inscribed with the details of his visit nailed to a pole. Fast forward nearly a century and another Dutch explorer Wilhelm de Vlamingh, turned up, collected the Hartog plate and took it back to Amsterdam, where you can see it today in the Rijksmuseum. Vlamingh replace Hartog’s plate with his own, copying the details from the original plate and adding an account of his own larger expedition. 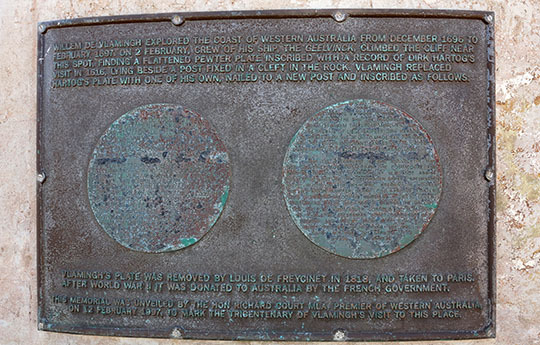 Another century passed and French explorer Louis de Freycinet arrived, souvenired the Vlamingh plate and took it back to Paris where it was promptly lost. A century later it turned up filed away on some backroom shelf and was returned to Australia where today you can see it at the Maritime Museum of WA in Fremantle, the port for Perth. Or at Inscription Point you can see reproductions of both plates – Hartog’s and Vlamingh’s – installed here in 2016 to mark the 400th anniversary of that first visit. ▲ English pirate-explorer William Dampier also made a visit, collecting plants you can still see at the Sharard Herbarium at Oxford University in England. 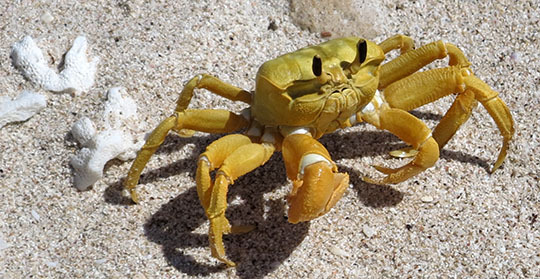 This colourful ghost crab is guarding the beach at Dampier’s Landing, just east of Cape Inscription. 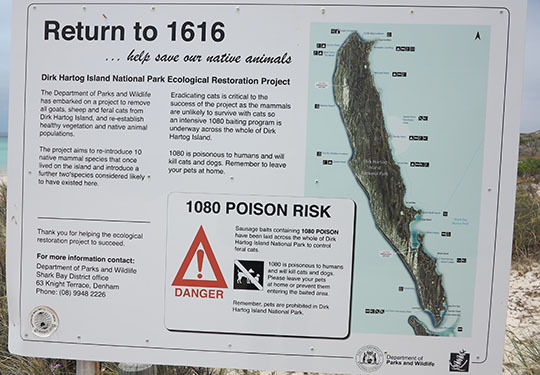 ▲ The Return to 1616 project aims to bring Dirk Hartog Island back to the same situation for animal life that it was when Hartog paid his historic visit. That meant rounding up and shipping off 5000 sheep (easy), killing off 10,000 goats (difficult) and exterminating hundreds of feral cats (extremely difficult). 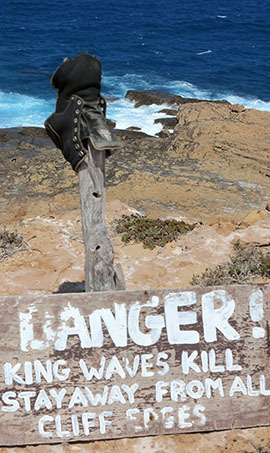 Killing the cats even required the installation of an electrified cat-proof fence across the island, but now they’re gone 10 of the 13 native mammals wiped out since Hartog’s arrival are being reintroduced. 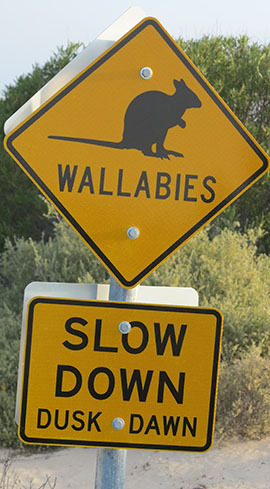 ◄ Along with two small wallaby species. ▲ The island’s often impressively large goannas have managed to survive the European arrivals. 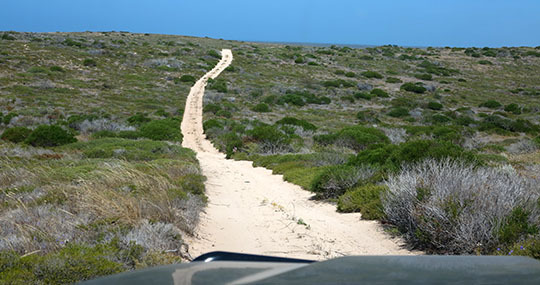 ▲ A typical Dirk Hartog sandy track, crossing the island from Mystery Beach to Sandy Point. Apart from driving up to Inscription Point – a 200km round trip which, with assorted diversions took us all day and we never encountered another vehicle – we also explored other island tracks, lookouts and beaches. 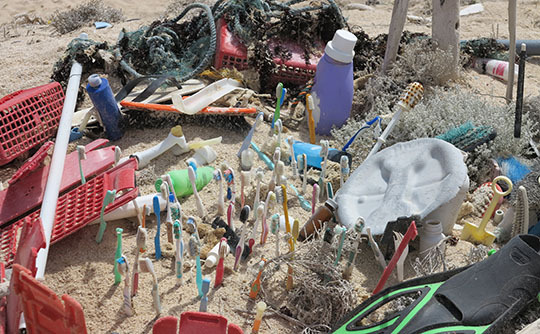 ▲ Like Mystery Beach which is noted for its flotsam and jetsam, like this little art installation. 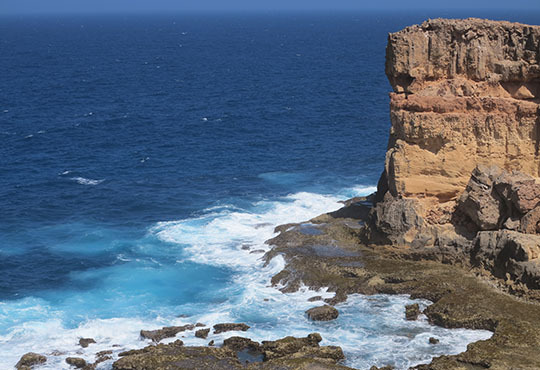 ▲ We also did some walking including the trek along the wild and wonderful west coast from the Blowholes. It’s a reminder why, if you were on an errant Dutch East India Company sailing vessel, this was not a good coast to collide with. ◄ Up top of the cliffs can be dangerous as well. 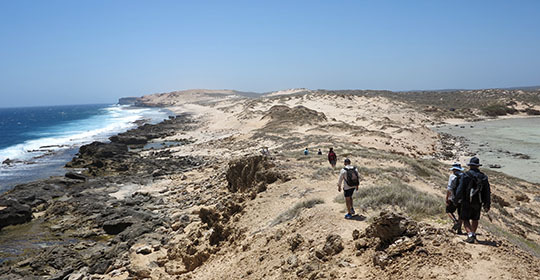 ▲ But our walking group from the Eco-Lodge made it successfully down the coast to Surf Point.